Can I register SoundEvents on CommonProxy or do they need to be in the main file? I don't see why a dedicated server would need to register sound events so this made sense to me. So I've been working on a mod that completely overhauls the music system in Minecraft, but I have one issue that I don't want to let my little "hack" 'fix'. Basically, I have my own MusicTicker that handles its own randoms, but while mine runs the Minecraft music ticker runs in the background as well. Is there a way to disable it outright, or somehow override it, or is the code below the only way of "handling" it? Okok, before you get mad at me for posting this in Modder Support in my defense this has to do with modding and helping me figure out how forge works overall. But seriously, I've searched for hours and I cannot find any way to get an Eclipse workspace to go within an Eclipse project like Forge has done. How did you guys do that!? Now that I have my tick loop running every 2 seconds (or however quickly I want it to update) using the ClientTickEvent, how do I detect if the user is hosting a LAN server? Is this even possible from the client? I do understand this concept. I believe my word choice is making this more confusing than it needs to be. The client has two sides when you enter a Singleplayer world: Two integrated sides, the Server Side, and the Client Side. You recently told me what both sides are for so I won't repeat that. When connecting to a dedicated server, the client still has two sides, but there is now a third side, or the dedicated server. I am still unsure how the dedicated server talks to the client and integrated server. When hosting a LAN world, the server side just becomes public, I believe. When connecting to a LAN world, it's as if you were on a dedicated and there are three sides. Please correct me if I'm wrong in any of these areas, as even after reading the new documentation on sides it is a little confusing for me. Hopefully now with the information you've provided me, I can achieve the effect I want. It is very much past my bedtime at this point, so any responses after this may come late (but if you respond sooner that's fine, I'll read it in the morning). Thanks for your help so far, and have a good night/day/evening or whatever else it is there. Yes, and that is all I'm trying to detect. I just need to know if the user is playing Multiplayer, including LAN, and if the player is playing Singleplayer. To set the presence, I need events when the user changes dimensions and first joins the world. The presence displays the current dimension the player is in. So, when the user joins a world, in a server or not, as well as changing their dimension, in a server or not, I need to update the presence. And each time I also detect if the user is in Singleplayer or Multiplayer. And event for when the user begins Open to LAN would be nice too. I am making a Rich Presence mod for Discord, and one of the things the presence will say is if the user is connected to a server or not. If they are, I'll add the ability to ask others to join. If not, disable it. And apologies for using that terminology, I've edited it to make more sense. - When the player has connected to a Singleplayer World. - When the player has connected to a LAN World. - When the player has connected to a Dedicated Server. I also need the player's current dimension in all of the above cases. I've tried using PlayerLoggedInEvent as well as EntityJoinWorldEvent. I got PlayerLoggedIn to work for a singleplayer world, but not a dedicated server. EntityJoinWorldEvent works fine, but I can't seem to find a way to limit it only to the current client. I ALSO need to know every time the player changes a dimension, and when the player has exited the end. This is a CLIENT-SIDE only party of the mod. PlayerChangedDimensionEvent and PlayerRespawnEvent both don't work for the dedicated server. Oh, also, while I'm here and this seems like a small thing to make a thread of so I just want to attribute this to my current messages, how do I get the version of Minecraft without doing Minecraft.getMinecraft().getVersion(); ? Okay, interesting. That makes sense, compared to last time I read it. I guess the most confusing part to me is, are these events logical-server only, or do they fire for both the logical-server and logical-client? And how are you supposed to know if the events run on the logical-server or the logical-client? And when would be the use cases to run something on either side? Oh? Have I been doing it wrong this whole time? I have the events only being added via the ClientProxy. Do I just not need SideOnly in that case? And yes, I have read your forge tutorial on sides. Was very confusing to me for some reason, but I understood most of it. I use PlayerLoggedInEvent to detect when the player joins a singleplayer world and NOT a multiplayer world. I use PlayerChangedDimensionEvent to detect when the player changes dimensions... should I be using ServerSide for this? This is a client-only section of the mod, it cannot run on servers. Okay, the dimension change event emits for the nether, in and out. Now, I try the end and.. wait what? It emits when the user enters the end, but does not emit when the user leaves the end via an end gateway. Okay, if this is the case, what's the event I should use for checking when a user leaves the end? Here's my test code right now. Just go with ClientTickEvent, check if "information right now" != "information we last send" and if so, send the info to the server and set "information we last send" to "information right now". Okay, all that stuff (buttons, showing information, icons and logos) are in fact a GUI. But what you're saying is that that GUI is outside minecraft and you want to send information to the interface that maintains that GUI. The problem with the events you were trying to use is they didn't have the information you needed. So as diesieben07 is recommending you can basically "poll" until the information is available in a tick event (with the client tick being the most obvious choice). Ohh! I apologize for the misunderstanding. If you had said "External GUI" I probably would have understood you. I thought you were talking about making a MINECRAFT GUI and I was very confused. 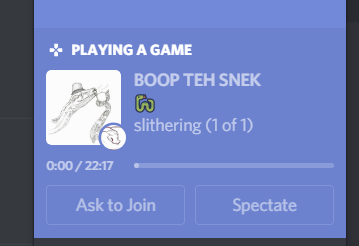 Discord has these things called "games" that when you're playing a game, under your username it will say "Playing <game name>". Recently, though, Discord added this thing called "Rich Presence", that allows game creators (or modders, like me) to give more information about the game, so instead of it just saying "Playing <game name>" it can show up with something like seen in the video. (With the server icon as the big square, and the crafting table as the small logo). In this menu, Discord allows game creators to add two buttons: "Ask to Join" and "Spectate". The Ask to Join button can be seen on a profile when someone is playing the game (they have an example of it here). When someone clicks the Ask to Join button, it will launch Minecraft and put them directly into the same server as the user. The issue is, the Ask to Join button requires an encrypted code to match up players to the correct servers. This code I need to make is a mix between the player's UUID, the mod ID, and the IP of the server, hence why I said UUID_MODID_SERVERIP. When another user on Discord sees your profile and clicks "Ask to Join", it will take the code, put it in the launch options of THEIR game, and then I need to decode it into where I can add the player to the server. For the Spectate button, it's the same issue. I need the UUID_MODID_SERVERIP-"SPECTATE" to be my "encrypted code", where it will force the user into spectate mode. I am making nothing that has to do with the Minecraft title screen or GUI, but integration with Discord (the chat engine)'s Rich Presence, which you can click here for the link to the Rich Presence Documentation. Although, yes, you did get what happens on the Ask to Join part correct. It will send a client side message where the user can say yes or no, and then it connects them to the game (although I'm still not 100% sure how the Ask to Join button works). Here's some images of what I'm talking about.